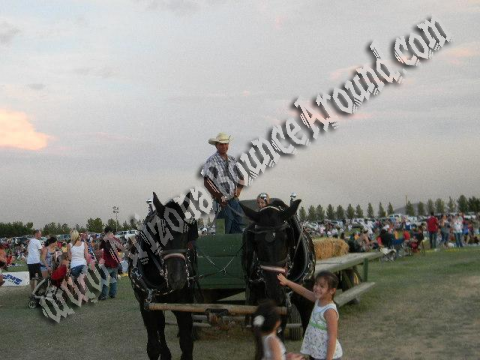 Have a Hay ride wagon at your party or event from Arizona Bounce Around. Our hay ride trailers have room for 25-30 people at the same time depending on the kid to adult mix. Everyone loves to ride on a Hay Wagon and we deliver it right to your event. Comes complete with staff and 2 horse team. Having hay rides at your event is a great way to add excitement to your carnival or event. Our hay rides are perfect for western themed events or holiday parties in Arizona. Our Hay Rides consist of a choice of the wagons Our wagons include- Trolley (no straw bales- seated wagon), Jail wagon (also seated wagon no straw bales), Flat bed wagons in different sizes (with or without straw bales), and a Fancy wagon (People Hauler without straw bales).